Practice mixing up your routine when having protein shakes and add a little spice into your life! You'll keep this healthy option fresh by changing up your creations. And don't forget you can keep your protein shake mix handy when you're at work or on the run. 1. 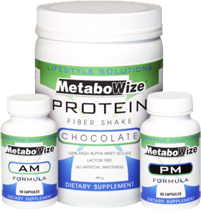 Mix 1 scoop of your MetaboWize Vanilla protein/fiber shake with 1 scoop of MetaboWize Chocolate protein/fiber shake for a "malt like" taste. 2. Try adding a Xooma Blast flavor to your MetaboWize Protein Shake for a little extra "blast" of flavor, and also receive 1.5 servings of real whole food derived fruits and vegetables. 3. Tired of eating almonds or cashews? Try substituting Pistachios. You should consume no more than 22 Pistachios per serving. 4. Blend your protein/fiber shake with fresh berries and freeze for a delicious Metabo-treat. 5. Try placing your almonds in water and letting them soak for a few minutes. You'll love this softer treat! 6. Add a scoop of ice to your MetaboWize shake for a different consistency. 7. Try varying your liquid, using Almond or Soy or Coconut milk. Enjoy the change in flavor. 8. When you have a blender handy, add several of the above combinations: alternative liquid, ice and a banana. 9. Mix 100% natural peanut butter in your MetaboWize shake (using a blender) for an extra boost of protein and a delicious nutty taste. 10. When eating at a restaurant make your meal "MetaboWize Friendly" by always asking for dressings and sauces on the side. And opt for broth, fruit or vegetable-based sauces rather than creamy sauces.